• Most genetically distinct subspecies of gray wolf in North America. • Also known as "lobo." 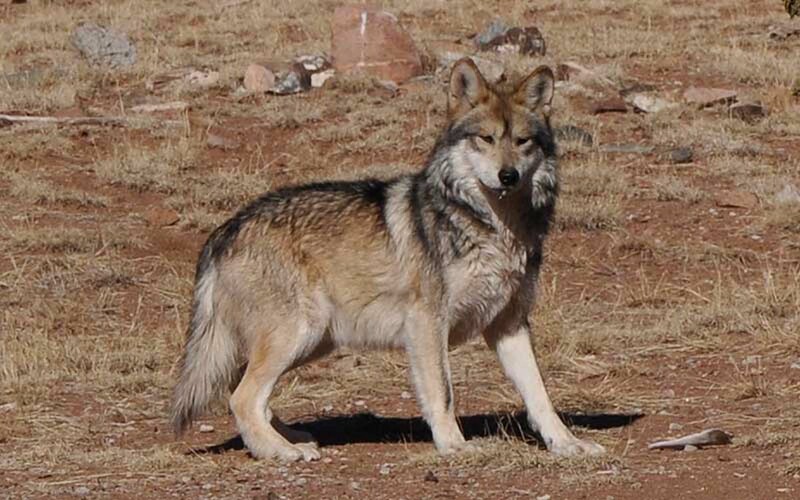 • Reintroduced in Arizona and New Mexico in 1998 through the Mexican Gray Wolf Recovery Program. • At last count, there were 83 in the wild. • Packs range from three to five wolves. 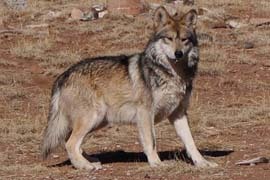 PHOENIX – A coalition of environmental groups notified the federal government Wednesday it intends to sue over what it considers inadequate action to re-establish the Mexican gray wolf in the Southwest. The five environmental groups, including the Tucson-based Center for Biological Diversity, said a lawsuit would force the U.S. Fish and Wildlife Service to develop a workable recovery plan for the species. “The Fish and Wildlife Service has three times begun a plan to save the wolves but has never concluded one,” said Tim Preso, attorney for Earthjustice, a nonprofit environmental law organization. Mexican gray wolves, added to the Endangered Species List in 1976, were reintroduced to eastern Arizona and western New Mexico in 1998. At last count, 83 wolves were in the wild. The program has been controversial from the start, with area ranchers complaining that the wolves are a menace to livestock and environmental groups saying federal officials haven’t done enough to create a thriving, genetically diverse population. Michael Robinson, conservation advocate for the Center for Biological Diversity, said the Endangered Species Act requires the federal government to create recovery plans tailored to the needs of each species. According to Robinson and Preso, a backlog has prevented the U.S. Fish and Wildlife Service from updating a stopgap proposal drafted in 1982 with the wolves in imminent danger of extinction. A Fish and Wildlife Service spokesman said the agency doesn’t comment on pending litigation but emailed what he said were examples of the agency’s efforts on behalf of the wolves, including reintroducing them to the wild after they became functionally extinct in the 1980s. Robinson said Mexican gray wolves still face a number of challenges, including a lack of protected territory and a lack of breeding pairs. “What we need is a science-based roadmap to recovery,” he said.